Stomp started as a brilliant idea of an energetic collaboration, between Luke Cresswell and Steve McNichols, as members of the street band 'Pookiesnackenburger' Britain's leading busking/cabaret musical group in 1981. They built on the idea throughout the years starting from street level in Brighton – and worked with some keen talent (including Rowan Atkinson and Bette Midler). They created big outdoor events, movies and orchestral performances. It expanded into many areas - equally at home on stage, in film and in the street appealing to all ages, races and cultures cultures. Making sounds and rhythm with any-old-thing that comes to hand is clearly in our genes. I'd hazard a guess that this activity has helped revive many a near extinction in our ancient past and reinvest it with a spirit of making music and dance - and humour. "...If you have a sense of rhythm and a sense of humour"
A modern covent Garden busker who used a cone and amused people has recently been given an 'antisocial behavour order' so it works better as a group activity "don't try this at home alone" or on the street in Covent Garden where Capital & Counties appear to be cracking down on buskers (shame). Luke was a self taught percussionist and Steve an actor, musician and writer who worked with the Covent Garden Community Theatre among others. The idea developed into the first STOMP in 1991. A combination of dance movement, percussion and comedy was made unique by the use of any common object that could be made to 'speak' - from rubber tubing and lighters to dustbin lids and brooms. Off the wall, out of the box - in other words original. After a Bloomsbury preview 1991, they were acclaimed in the Edinburgh Festival winning 'Critic's Choice' (Guardian) and 'Best of Fringe' (Daily Express). Such was the enthusiasm for the show that they played to audiences who shared the ebullient energy around world for four years. They then started in the West End at Sadler's Wells Theatre in 1994 winning 'Best Choreography Award in a West End show'. The season was a massive success followed by a production at Royal Festival Hall in London which broke all box office records. 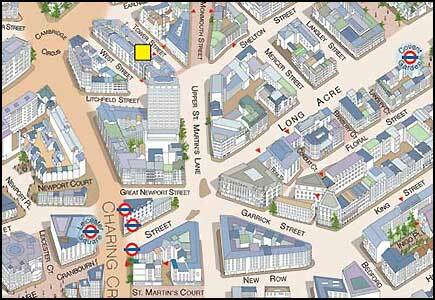 (established by Frank Sinatra in 1972). What followed was another world tour during which time adaptations were made for television, collaboration between STOMP and Sesame Street Muppets, a Stomp Oddesey in a Brazil carnival and the IMAX movie Pulse - to name a few. It opened shows in many cities including New York, Sydney, South Africa and in Las Vegas where they build an expensive theatre especially for it. 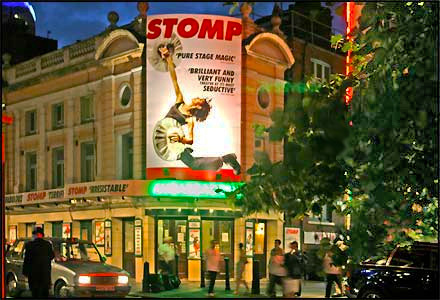 In 2002 Stomp opened at the Vaudeville in London's West End. The show has no words or music genres to limit the appeal to any audience that likes rhythm, which is as common to all men and women as the beating of the heart behind a high energy group activity. The fluid undercurrent of skill and complexity is exciting to watch - there is no story or talking except for the odd addressing to the audience - this show's success speaks for itself - it's the sort of show you go to and then return with friends to enjoy another unique night.